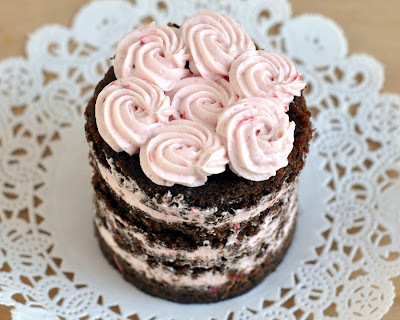 When I first made this strawberry icing, I said I couldn't wait until I put it on a chocolate cake. Oh boy! I was right. It is so yummy! 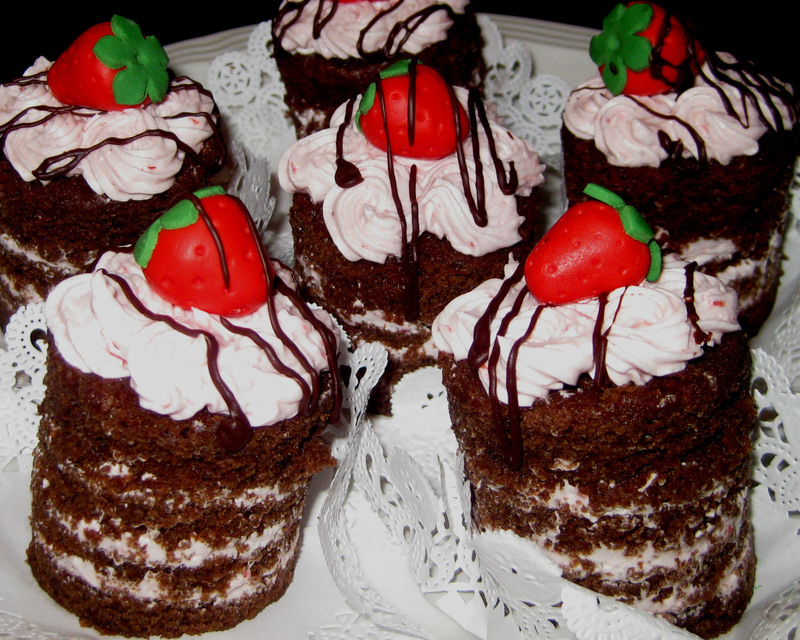 And making these into mini-cakes meant I got to have that much more icing on/in each piece. It was really good. I highly recommend it. 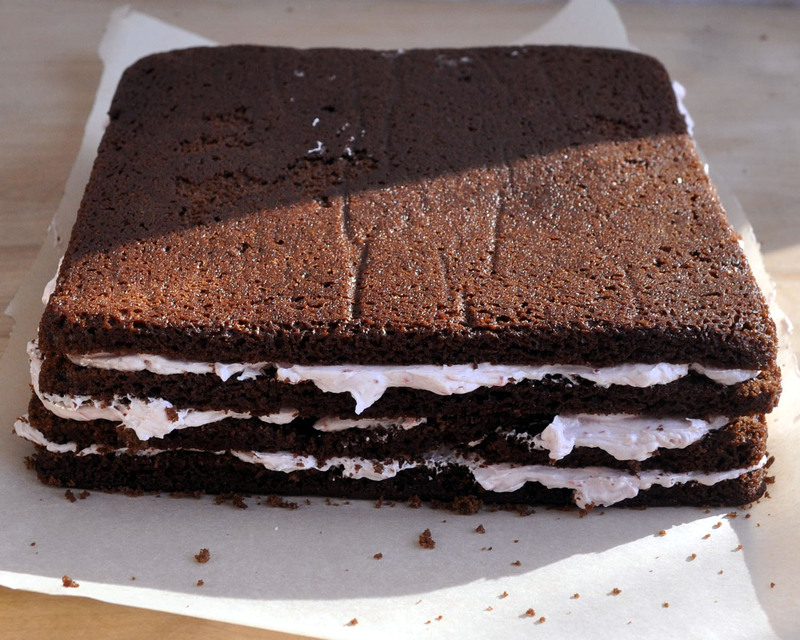 Bake the chocolate cake in a 9"x2" square pan. While the cake bakes and cools, make one recipe of my strawberry icing. This will yield 15-20 2"x3" round mini-cakes. When the cake is cooled, flip it over onto parchment paper so that the top is on the bottom and the bottom is on the top. 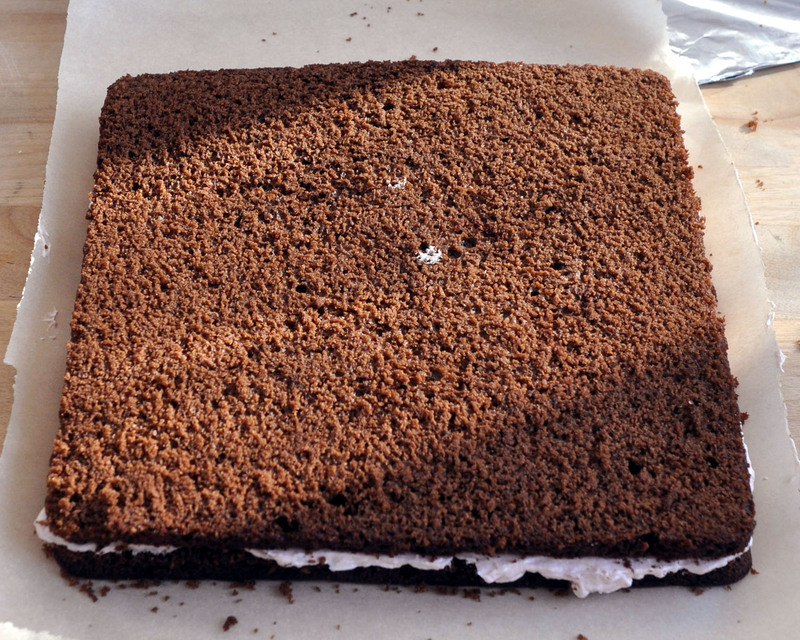 If your cake bakes unevenly, you will also want to level the top before you begin torte. 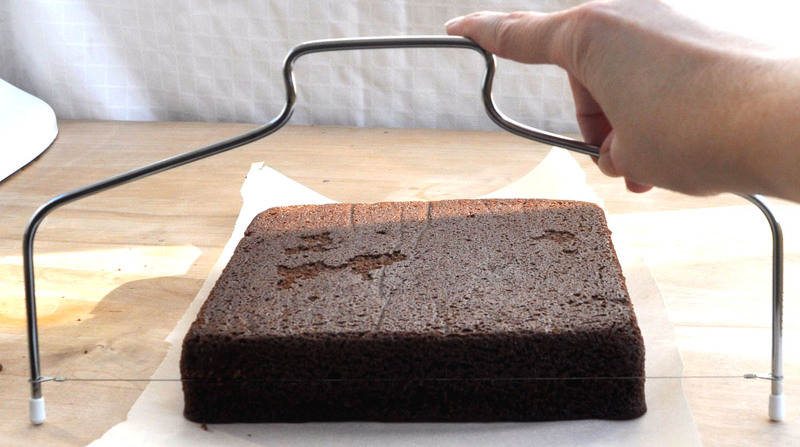 To torte the cake, I use my cake leveler. I first cut the cake in half horizontally, then use it again on the top and bottom halves to make a total of four layers. To separate the layers, I covered pieces of cardboard with foil, and slid the cardboard separators in between the bottom two layers. Remove the cardboard to leave just your bottom layer on the parchment paper. 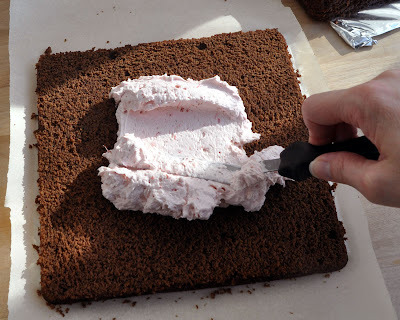 Add the next layer, and again spread 1 cup of the icing. Repeat with the third cake layer and another cup of icing. Top it with the final layer of cake- but do not yet spread the icing on the very top. Now for the messy work... you may want to refrigerate the cake at this point for 30 minutes or so to make the icing a little less sticky, but be sure you don't let it get too hard, either. 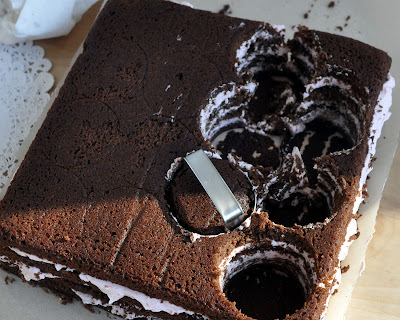 To cut out the rounds, I pushed the cutter through the cake, and turned it a bit to get it out. You can also pull it out to the side. To maximize your cake, I placed the rounds as close to one another as possible. I place each one on a paper doily, and topped them with small rosettes using a piping bag and tip #18. 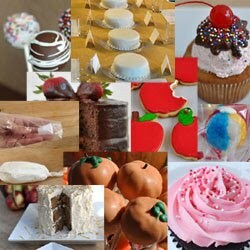 You could also add a rough/peaky swipe of icing to the top of each one. If you want, you can also top them with a fondant strawberry decoration, and drizzle them with some melted chocolate. 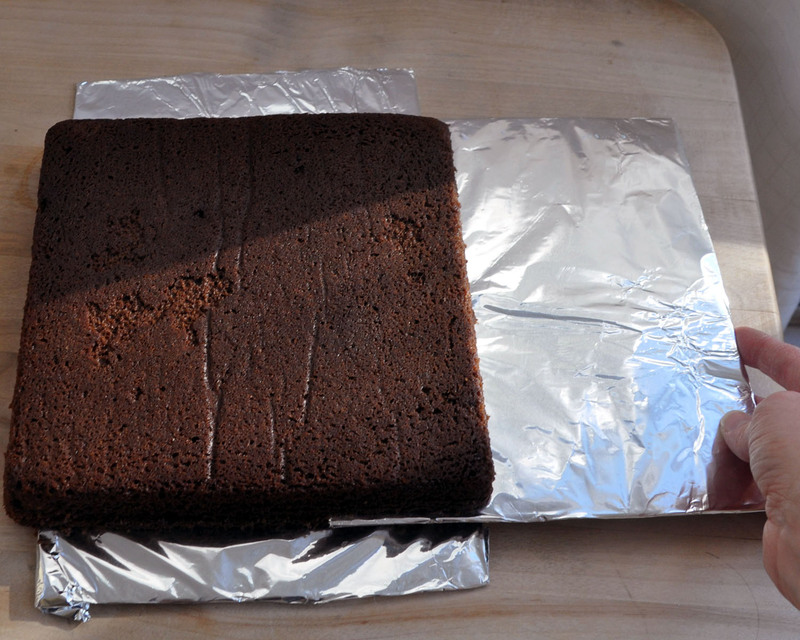 I drizzle the chocolate using a disposable decorating bag with a tiny bit cut off of the end. what size was your cookie cutter? like what size were the cakes? The cutter was a medium-sized biscuit cutter, so approx. 2 1/2" diameter.